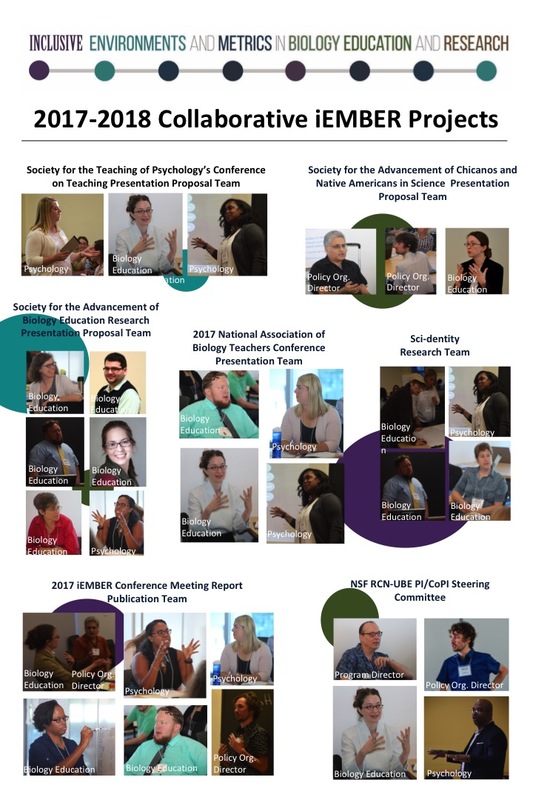 The Environments and Metrics in Biology Education and Research (EMBER) network focuses on expanding an understanding of how to create inclusive, supportive and engaging environments to foster the success of diverse students. In the incubator phase, the EMBER network will host a workshop to bring EMBER collaborators together to facilitate communication, collaboration and plan the full network. iEMBER NETWORK ACTIVITIES The iEMBER research coordination network will address significant central questions concerning student experiences that affect retention and success. The focus and activities of the iEMBER network will address multiple Vision and Change Action Items. The 2017 conference has a two-fold purpose, to discuss coordination efforts for the iEMBER network and to initiate and communicate ideas for collaborations. The conference will employ an innovative networking strategy combining elements of a conference with that of an entrepreneurial “start-up” weekend. Mini-seminars and round-table discussions will be combined with start-up elements where participants pitch ideas and form working groups.